The CGIAR Research Program on Grain Legumes and Dryland Cereals (GLDC) builds on the work done by three CGIAR Research Programs from 2012 to 2016: Grain Legumes, Dryland Cereals and Dryland Systems. GLDC aims is to increase the productivity, profitability, resilience and marketability of critical and nutritious grain legumes and cereals within the semi-arid and sub-humid dryland agroecologies of sub-Saharan Africa and South Asia. These agroecologies are where poverty, malnutrition, climate change and soil degradation are among the most acute globally. It is based on metrics of poverty prevalence, agroecological alignment, value of crop production, foresight projections of significant demand and/or deficit in supply, ex-ante return on research investment, consideration of quality, market and environmental traits and alignment with stakeholder priorities. 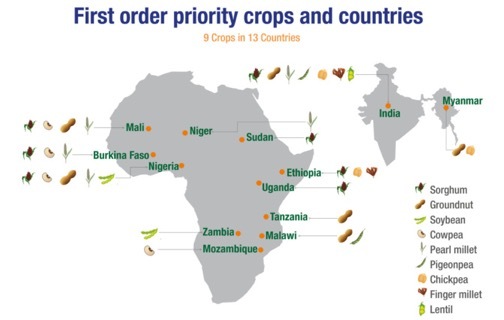 Consequently, first-order priorities for research consist of an incomplete matrix of the 9 crops grown in 13 countries. By 2022-2030, as a consequence of this research, 8.9-21.7 million farm households will have adopted improved varieties, helping 4.4-11.8 million people to exit poverty and 12.7-24.8 million people meet daily nutritional requirements, with 50% of beneficiaries being women. The logic is that improved innovation capacities within agri-food systems of key cereal and legume crops will enable coherent and integrated research and development, production, market and policy reforms that deliver resilience, inclusion, poverty reduction, nutritional security, environmental sustainability and economic growth. Sorghum, millets and the grain legumes are grown, eaten and traded together within the same agri-food systems. The CRP will coordinate research interventions that recognize and build on the synergies in these cereal-legume-tree-livestock systems.